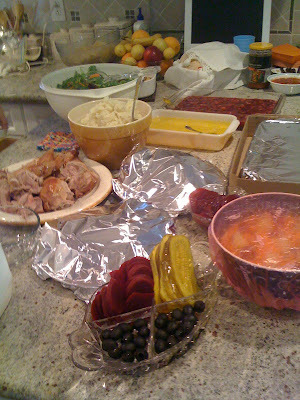 Thanksgiving Dinner with my in-laws was lovely. Especially the stuffing. And the jello. And the mashed potatoes and gravy. And the spinach souffle. And the glazed yams and apples. And the turkey. And the sweet rolls. And the pumpkin pie. And the best part? My skinny pants still fit the morning after! Hope all of you had a great holiday with your families. Now….bring on Christmas! Next page Next post: Tender Tennessee Christmas?